A large basket of flowers left by the 'Mao Zedong Thought Group of Shangqiu, Henan' sits on the grave of Mao Zedong's wife Jiang Qing at Futian Cemetery, Beijing, April 5, 2018. For decades after late supreme leader Mao Zedong ushered in 10 years of mayhem and bloodshed with his Great Proletarian Cultural Revolution, the ruling Chinese Communist Party banned any commemorations of its key figures or events, and public debate on the era was limited to the official line. During the traditional grave-tending festival of Qing Ming in April, security guards would be posted at the grave of Mao's widow Jiang Qing, who along with the rest of the "Gang of Four," took much of the blame for the violence and turmoil of the Cultural Revolution (1966-1976). This year, under the potentially lifelong rule of President Xi Jinping, no such restrictions were in place. Instead, as Chinese across the country converged to pay respects at their ancestral tombs, some visitors were able to leave a large floral tribute on Jiang's grave in Beijing's Futian Cemetery. A photo of the scene seen by RFA showed a large basket of flowers left by the "Mao Zedong Thought Group of Shangqiu, Henan." The inscription reads: "For Mother Jiang Qing, who will never be forgotten." The tomb has previously been covered by the authorities at sensitive times, including Qing Ming. Online searches for the "Mao Zedong Thought Group of Shangqiu, Henan," yielded no results on Thursday. Shangqiu was the birthplace of one of Mao's right-hand men, Xie Jingyi. Maoist activists were prevented from making a similar gesture by police at the Futian Cemetery on Qing Ming festival in 2015, RFA reported at the time. But an anonymous source said that this year, the offering has remained in place, and people were allowed to visit, leave offerings and take photos. "Every year, it was the same with regard to Jiang Qing [until now]," the source said. "I think it shows just how far to the left our society has moved." Liu Jinhua, a self-confessed Maoist from Leshan in the southwestern province of Sichuan, said the honoring of Jiang is ultimately an honoring of Mao. "There have been many different views of the Cultural Revolution," Liu told RFA. "Everything Jiang Qing did was the result of a political struggle." "Jiang Qing was carrying out the orders of supreme party leader Chairman Mao, and yet she was the one described as the counterrevolutionary," he said. 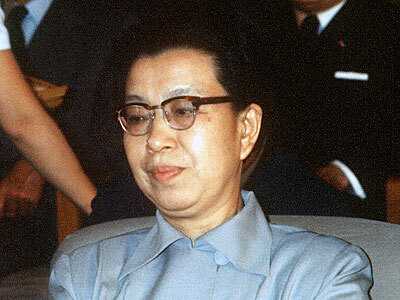 "None of this would have been decided by Jiang Qing herself." The official view of reform-era governments since Deng Xiaoping has been that the Gang of Four was a political force within the ruling party that was headed by Jiang, Wang Hongwen, Yao Wenyuan, and Zhang Chunqiao until the arrest of its members on Oct. 6, 1976. Liu, now 83, said Jiang's arrest and the subsequent trial of the Gang of Four were a way of indirectly attacking Mao's legacy rather than a reference to substantial crimes. "It wasn't right ... the casual way in which those members of the Politburo just had them arrested like that," he said. "It was a political coup ... a case of punishing Jiang Qing so as to punish Mao Zedong." What started as a campaign against "capitalist roader" officials in 1966 turned into a decade of violence and repression, as students and workers formed squads of radical Red Guards, who killed hundreds of thousands in purges and bouts of warfare. Qualified professionals like teachers and doctors were locked up in “cow pens,” while schools and universities were closed and health services fell into disarray under the supervision of "revolutionaries." Jiang presided over the inception of "revolutionary model operas," the only form of entertainment available to China's population from 1966 until Mao's death and the fall of the Gang of Four in 1976. The arrest and trial of the Gang of Four for counterrevolutionary crimes brought people out onto the streets of Beijing in celebration. An elite private conference in 2011 titled "Remembering the Smashing of the Gang of Four, 35 Years On" was convened by Hu Deping, son of late disgraced former premier Hu Yaobang, whose funeral sparked the 1989 student movement. Sources said at the time that Maoist elements at the conference had used it to suggest a return to the Cultural Revolution as a way of cleansing the ruling party of corruption, possibly laying the groundwork for Xi Jinping's widespread anti-corruption campaigns and subsequent moves towards sweeping censorship and control of everyday life. Xi was vice president at the time, and took over as party chairman in November 2012. The National People's Congress (NPC) removed the two-term limits from the offices of president and vice president last month, paving the way for Xi to rule indefinitely.